Analyzing and modeling the power and energy consumption of machining processes have been considered to be an important approach to enhance the energy performance of manufacturing process. As drilling process is one of the most commonly used technologies in manufacturing, specialized research on the modeling method of material drilling power of drilling is very rare. The predictive accuracies of existing models for feeding power and material drilling power have great potential for improving. To fill this gap, improved predictive models of feeding power and material drilling power of drilling process are proposed in this research. 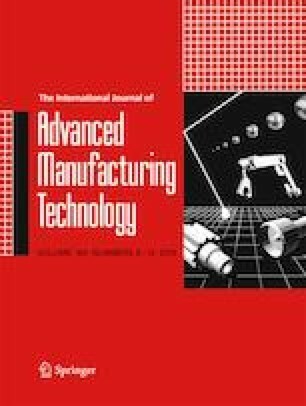 To show the feasibility of the proposed modeling methods of feeding power and material drilling power, extensive experimental studies were carried out on a machining center. The research results show that the predictive accuracies are generally improved by 1–2% with the established feeding power model in this article compared with the existing model. Moreover, the predictive accuracies of all the tested drilling cases by using the established material drilling power model are above 90.0%, and a high average accuracy of 95.0% is achieved. The established power models of drilling process in this research build a good basis for modeling of total drilling power and energy optimization. The authors gratefully thank all the editors and reviewers for their valuable suggestions on the improvement of this paper. This research is supported by the National Natural Science Foundation of China (Grant No. 71701113), the Project of Shandong Province Higher Educational Science and Technology Program (Grant No. J17KA167), the Shandong Provincial Natural Science Foundation, China (Grant No. ZR2016GQ11), and by the SDUST Research Fund (Grant No. 2018YQJH103).